Purchasing fine jewelry isn’t like purchasing other luxury products. After all, what other purchases could you compare to purchasing items that are usually billions of years in the making. The precious stones with which fine jewelry is created not only have a unique level of complexity, they are also known to be extremely unique. Moreover, the investment associated with fine jewelry makes it essential for you to understand how to best choose fine jewelry for yourself. OROGOLD brings you a short and simple guide which offers you fine jewelry shopping tips. While this ORO GOLD guide isn’t everything you need to know when it comes to fine jewelry shopping, it is definitely the perfect place to start off. One of the first things that you need to do is to understand your likes and dislikes, keep in mind your personal styles and make an inventory of the things you have Vs the things you need. Remember, knowing what you like and what you need is the key to fine jewelry shopping. Make sure that you stick to the reputed dealers when it comes to fine jewelry shopping. In today’s market, you can find fine jewelry being sold almost everywhere. However, it always makes sense to stick to the reputed and established enterprises. Since most consumers don’t even understand the difference between karats and carats and can’t distinguish between a sapphire and a blue topaz, it is easy for fraudsters to take buyers for a ride for a quick buck. One of the most basic tips that comes with any form of shopping is that you should understand what you can afford and what you cannot. This means that you should know the amount that you’re comfortable spending even before stepping foot in the jewelry store. Make sure that you spend within your means and you won’t have to regret it later. Make sure that you talk to a number of buyers before zeroing in on one. The more buyers you approach, the better the chances of a decent price. Make sure that you call ahead and ask the price per gram of gold. This helps you to shorten your field and save a lot of time and effort. As they say, if it is too good to be true, it is most probably not. If a store offers you with discounts that are unheard of, play it safe. Shop around and compare the actual value of the item. Try to determine the reputation of the store. You might also find that the regular price of the item at other stores is lesser than the so called discounted prices. Make sure that you get someone you trust to come along with you. Jewelry purchases are personal decisions and it is important to choose wisely. It always helps to bring along a friend who understands your tastes and has a balanced head on her shoulders to stop you from getting carried away. It is very important to fall in love with the fine jewelry that you purchase. They say that if you find the right piece for yourself, you will find the piece talking to you. And even though jewelry designers love to play with the latest trends, when it comes to purchasing fine jewelry, you’re always better off choosing styles that won’t fade away for generations. So unless you find something that leaves you speechless, don’t purchase it. Make sure that you always look for the manufacturer’s hallmark on your karat-marked jewelry because it is mandated by the law in many countries (including the US). If you find a trademark, it means that the manufacturer guarantees the accuracy of the karat mark. 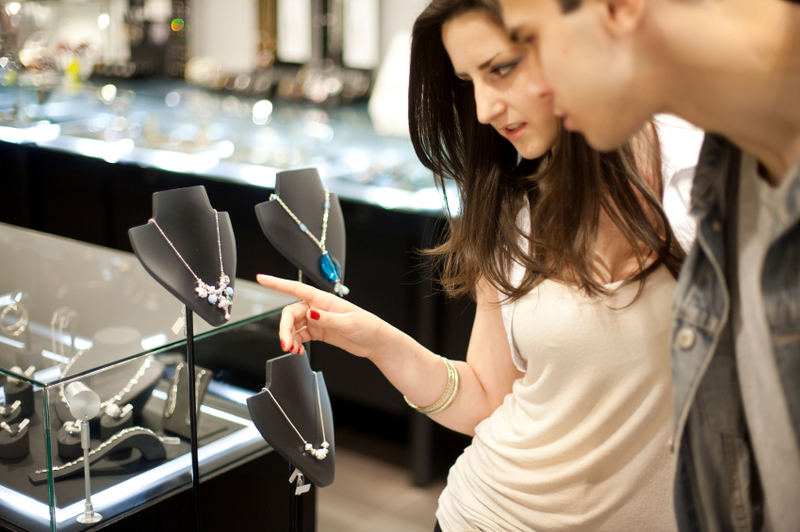 While purchasing fine jewelry, it is essential to get the seller to write a complete description of the jewelry on the receipt. Things like karat for gold; cuts, clarity, carat weight and color for diamonds; descriptions of carat weight and overall color for colored stones should specifically be mentioned on the bill of sale. Have any other fine jewelry shopping tips that you would like to share with OROGOLD readers? Feel free to share your thoughts using the comments box below!